— Demand a halt to the stoning execution of Sakineh Mohammadi Ashtiani, as well as the stoning executions of Azar Bagheri (age 19) and Marian Ghorbanzadeh (age 25), whose stoning sentences were recently revealed. They should be granted unconditional freedom. — Demand unconditional freedom for Zeinab Jalalian, a female political prisoner who faces imminent execution by hanging. — Demand that governments remove the Islamic Republic from the UN Commission on the Status of Women. — Demand that the Islamic Republic cease its efforts to execute Mohammad Reza Haddadi, jailed since age 15 for an alleged murder, the confession to which he has retracted. Sample letters appear below the list of email contacts. 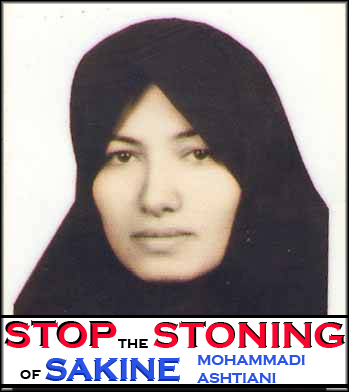 I am writing to you with an urgent request that you intervene with the authorities in the Islamic Republic of Iran, who are preparing to stone to death Ms. Sakineh Mohammadi Ashtiani for the alleged act of adultery, an act to which she was forced to confess but later recanted, and for which she has already received 99 lashes. Execution is murder by the state, and stoning is the most savage and merciless form of execution and should be abolished in Iran and worldwide. You must step in and demand a halt to this and other ongoing criminal proceedings in the Islamic Republic. Diplomatic sanctions, including travel bans, freezing of bank accounts, and expulsion from international organizations such as the UN – especially the UN Commission on the Status of Women – must be used to force the Islamic Republic to comply with international law and standards of human rights. 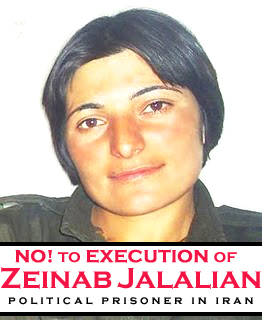 I am writing to you with an urgent request that you intervene with the authorities in the Islamic Republic of Iran, who are preparing to execute female Kurdish political prisoner Ms. Zeinab Jalalian. Execution of political prisoners is illegal under international law. You must step in and demand a halt to this and other ongoing criminal proceedings in the Islamic Republic. Diplomatic sanctions, including travel bans, freezing of bank accounts, and expulsion from international organizations such as the UN – especially the UN Commission on the Status of Women – must be used to force the Islamic Republic to comply with international law and standards of human rights. 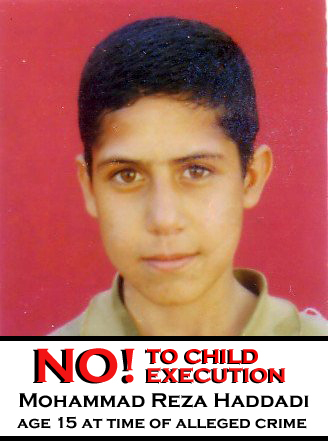 I am writing to you with an urgent request that you intervene with the authorities in the Islamic Republic of Iran, who are preparing to execute Mohammad Reza Haddadi, who was only 15 years old at the time that he was jailed for an alleged murder, which he has denied committing. The execution of people who were under age 18 at the time of their alleged crime is illegal under international law. You must step in and demand a halt to this and other ongoing criminal proceedings in the Islamic Republic. Diplomatic sanctions, including travel bans, freezing of bank accounts, and expulsion from international organizations – especially UNICEF – must be used to force the Islamic Republic to comply with international law and standards of human rights. I am writing to ask you to cover the ongoing human rights abuse situation in Iran, specifically the stoning execution cases of Sakineh Mohammadi Ashtiani (age 42), Azar Bagheri (age 19) and Marian Ghorbanzadeh (age 25), as well as the case of female political prisoner Zeinab Jalalian (age 27) and the case of Mohammad Reza Haddadi, who was only 15 years old when he was imprisoned for an alleged murder. This is outrageous! Iran should be punished for these crimes against humanity! How can it be changed and who can stop this cruelty? Let’s ask our government to expell Iran for the United Nations. I am writing to you with an urgent request that you intervene with the authorities in the Islamic Republic of Iran, who are preparing to execute Ms. Sakineh Mohammadi Ashtiani for the alleged act of adultery, a non-crime. By stoning or by hanging, it is wrong to execute her. And by standing for Sakineh, I stand for all those threatened by the Islamic Republic’s barbaric use of execution as its primary method of repressing and terrorizing the population in order to stay in power. Diplomatic sanctions, including travel bans, freezing of bank accounts, and expulsion from international organizations such as the UN – especially the UN Commission on the Status of Women – must be used to force the Islamic Republic to comply with international law and standards of human rights. wir sind im Welt gekommen weiter leben,jeder darf leben,ob woll alle schwerigkeiten regiongen,bringen.Menschen sollen behandeln wurden,nicht morden. جمهوری اسلامی ایران یکی از حاکمیت هایی است که از دو دهه آخر قرن بیستم تا به امروز مردم ایران را به دلیل دگراندیشی و آزادیخواهی و طرفداری ازاصول ابتدائی جامعه مدنی تک تک و بطور گروهی میکشد، احکام اعدام در این رژیم بر اساس قوانین جامعه بدوی توسط قضات دینی و قوانین اسلامی هر روز صادر و اجراء می گردند. امروز، جمهوری اسلامی ایران از نظر تعداد اعدام شده گان در رده دوم جهان قرار دارد. هر روز خشونت این رژیم نسبت به شهروندانش بیش از پیش میشود . در روزهای اخیر جمهوری اسلامی دهها تن دیگر را به دلائل باطل، بدون رعایت اصول ابتدایی قضاوت، بی توجه به حق دفاع متهمین وبرخورداری از حق داشتن وکیل آزاد اعدام و از تحویل اجساد اعدام شدگان خود داری می کند. زمان آن فرارسیده است که ماشین اعدام ها در ایران هر چه زودتر متوقف شود و احکام صادر شده باطل گردند .ما باید دست در دست برای لغو حکم اعدام در ایران کوشش کرده و به رژیم جمهوری اسلامی ایران هشدار دهیم تا از اقدامات نا عادلانه خود دست برداشته اعدام انسانها راتعطیل سازد . ما باید از مردم ایران در هر کجای دنیا که هستند ، از آزادیخواهان جهان ، ازهمه ترقیخواهان، روشنفکران ، نویسندگان ، هنرمندان و اززنان و مردان سیاسی معتقد به لغو حکم اعدام تقاضا کنیم با اقدامات عملی و عاجل خود برای لغو حکم اعدام در ایران هم گام و هم صدا شوند. ma ta residan bimargi omid zendehim.va dar har sharayti baray nejat jan ensanha talash mikonim. It is 21st century yet people live as if in stone age!! Open your eyes, open their eyes and hearts. Life is short and precious and we have no right to end it!! There must be a way to stop!! JUST STOP!!!! Nobody has the right to end somebody’s else’s life.Why?Because life is a Gift from God ONLY Him can take it away!Thou shall not kill says one of the Commandments of God.We HAVE to obey!Though shall NOT judge!Who is perfect to judge other people?If that woman has commited the sin of adultery,which according to Christianity is very serious sin,let God judge her,NOT humans!This woman must be forgiven,go back to her family and repent for her sin.She must be given a chance to live a sinless life.